What Is I Ching Hexagram 23 All About? Po is the Chinese name of the I Ching Hexagram 23. This has inner and outer trigrams forming mountain over Earth. 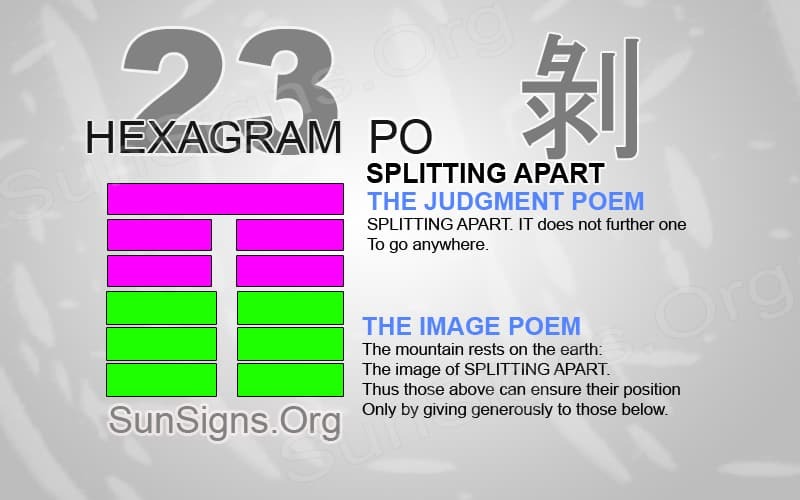 This Hexagram is called ‘splitting apart’ or named ‘stripping’ or ‘fraying.’ Hexagram 23 shows the necessity for abandoning a situation to progress. The buildings, no matter how strong the foundation they are built on, will eventually tumble and fall. It is difficult to look past all the effort to see the potential danger of standing on top of a falling building. Hexagram 23 shows that you need to dismiss certain situations and leave them behind to progress. This is a hard lesson for anyone to learn. Especially so, when you put in great effort into building up a project at work or even a personal relationship. Ponder deeply when facing a difficult situation. This can be a roadblock at work or a different issue in a relationship. Take some time to see if there is a solution to the problem to salvage the project. Don’t waste too much time trying to create a new plan of action. Waiting too long can sometimes trap you beneath the rubble of a failing plan. Then, you won’t even have time to back out. If there is no way to fix the issues, then abandon the whole plan together to progress. Getting rid of a plan or ending a relationship is not giving up. It can often feel like this when someone discourages us with the problem at hand. We must remember the reason we are abandoning this plan. So that we can prevent ourselves from further frustration and sorrow. Nothing good is currently coming from this certain path. And, to change what direction we are traveling in, we must rid our life of what is holding us back from our full potential. It is often hard to look past all the difficulties. But you have to see the opportunities and growth that is beyond this current time. Relationships are often the most difficult to abandon. Reasons for ending a relationship include issues with communication between partners. If one person is constantly talking, the others don’t get a chance to speak. This creates a dominating relationship. Then, there can be no progress. If the relationship is abusive, it is sometimes hard to end the relationship out of fear. You can take some steps to end any relationship. But, it is the hardest when we truly care and love the other person. It is sometimes hard to see past how we feel to create a better change in our life. Also, there are many strong emotions tied into any project or business. This is because it has been built up through lots of hard effort and time. But if your business is moving in the wrong direction, try to make changes. If that is not possible, then give thought to giving it up. We must remember that everything in life is temporary and nothing can last forever. I Ching 23 says that new opportunities are always arising when we rid ourselves from things that hold us back to progress. The image of SPLITTING APART. Only by giving generously to those below. Hexagram 22 doesn’t relate to the current ending situation. But, instead, it shows that being unable to act against a troubling situation can lead to failure. We must be willing to regain harmony and positive influences in our life. Only then, will we recover from leaving behind a relationship or project? Before starting a new journey or project at work, make sure to break down any old buildings. These might be actually, holding you back from obtaining real success. There is nothing wrong with breaking away.